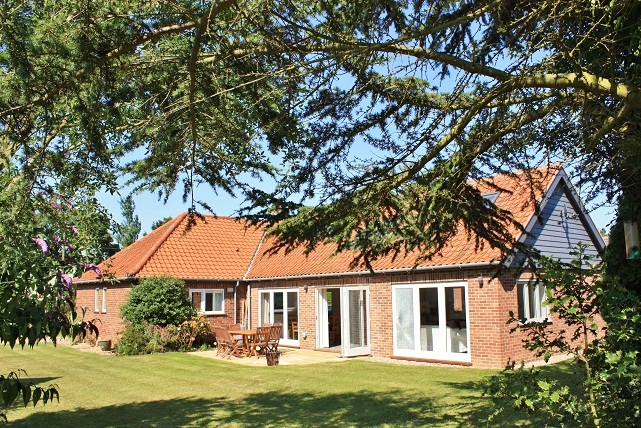 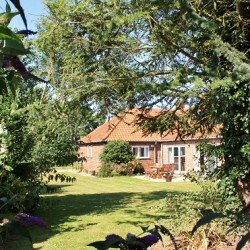 Wonderful, practical family holiday home with a large garden and plenty of off road parking in Blakeney With a five minute stroll to the quay and all village amenities, large gardens and plenty of parking, Richmond House is the ideal venue for family holidays or friends gathering together for a weekend enjoying beautiful Blakeney. 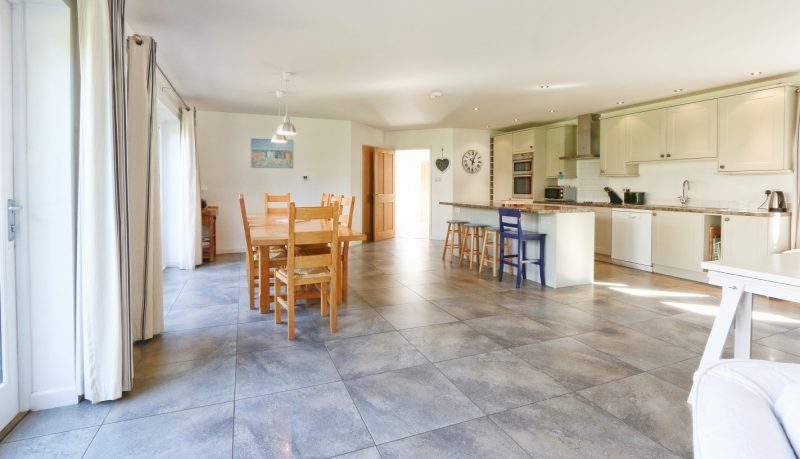 Three bedrooms on the ground floor with two bathrooms plus a brilliant ‘master suite’ on the first floor mean adaptable accommodation for all ages and the huge open plan living area, with kitchen and dining zones incorporated, works incredibly well for easy family living. 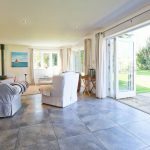 The lovely owners of this newly renovated property have created a very light airy feel throughout the house, evident from the moment one enters the hall which is open from the ground floor to the roof. 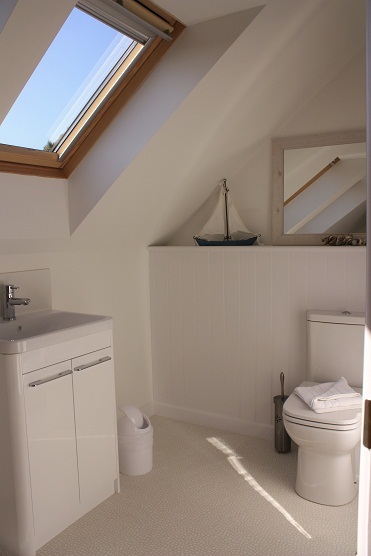 Pale oak doors , glazed tile flooring to the main living areas and neutral wool carpets in the bedrooms help create the coastal feel. 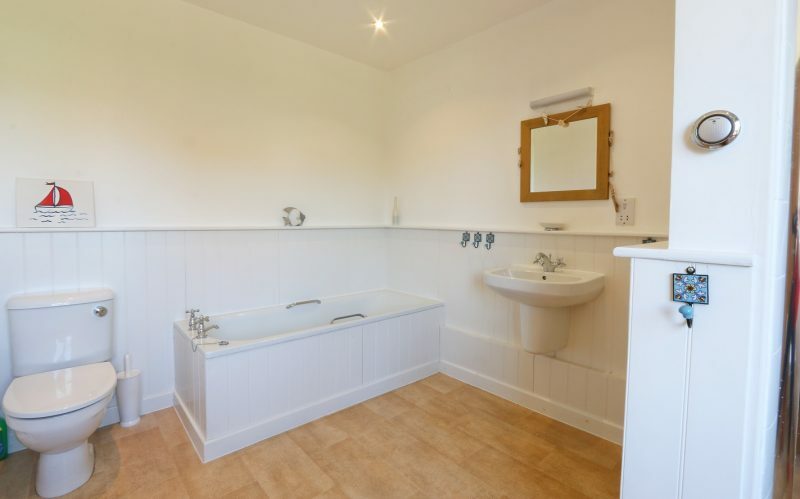 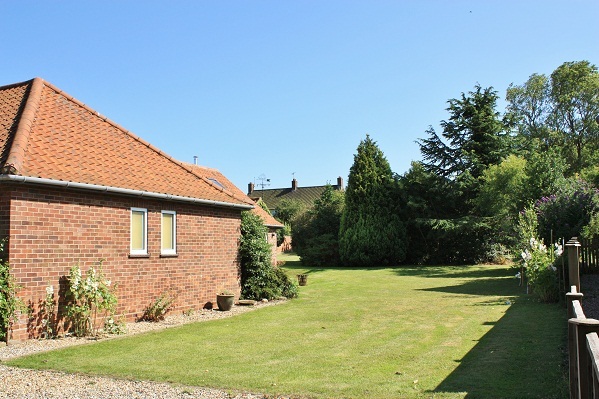 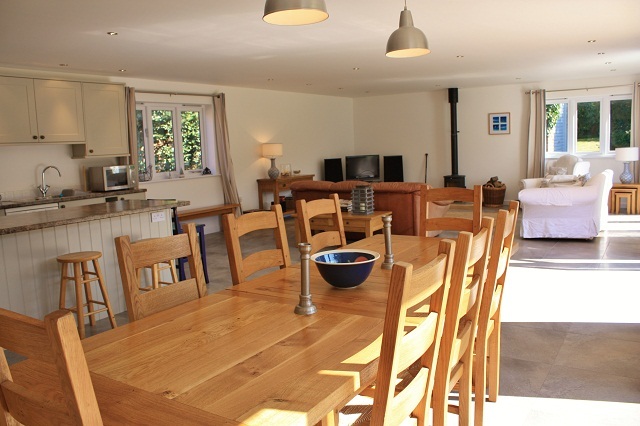 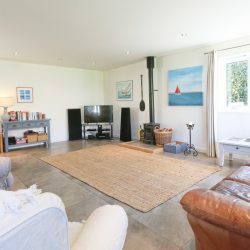 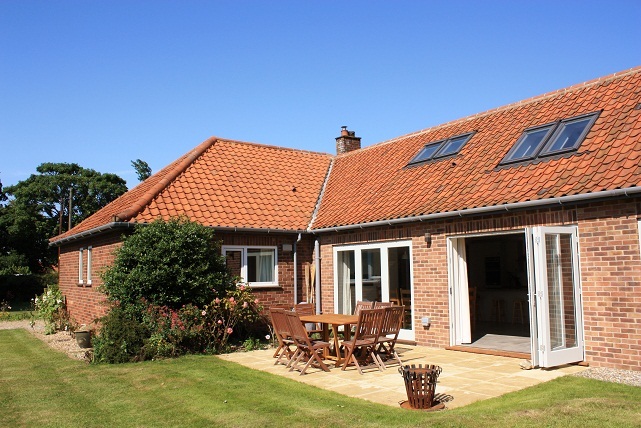 The house has full oil central heating with under floor heating in the hall and living rooms plus a wood burning stove making it ideal for large gatherings in all seasons. 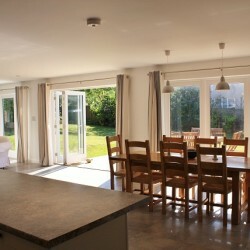 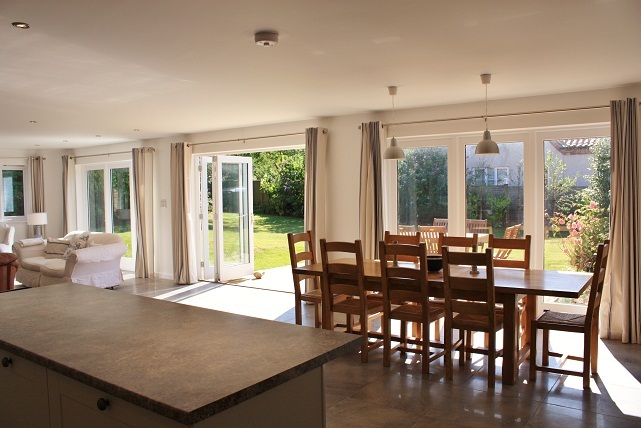 The main living room has windows and French doors on three sides making it wonderfully light. 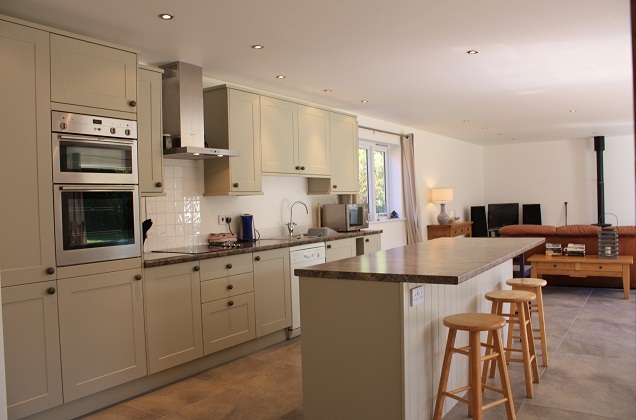 The kitchen is well fitted and within the pale painted units are a Neff double oven, halogen hob and integrated fridge with freezer below. 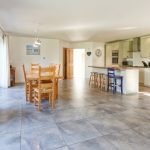 There are all the usual appliances, dishwasher, microwave and toaster etc and the granite style topped island unit holds a good selection of crockery. 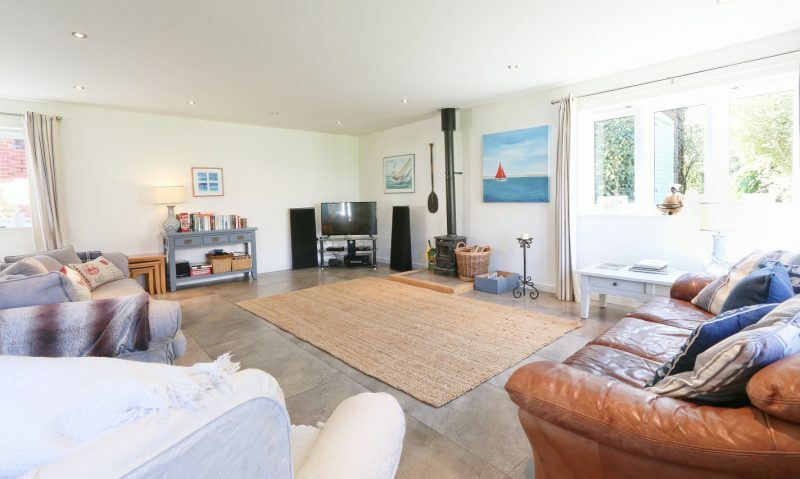 Adjacent to the kitchen is a large oak dining table easily seating eight and the rest of this large room is the sitting area with comfy sofas and arm chair arranged around the log burning stove. 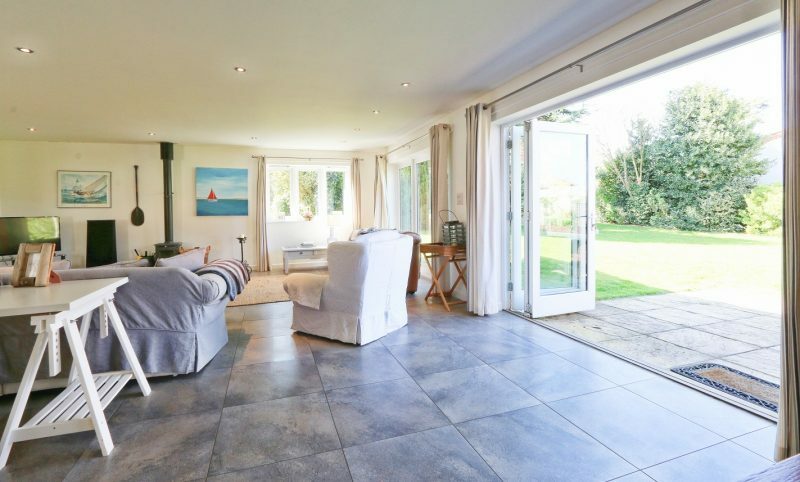 Three sets of French windows arranged down one side of the room with the middle ones opening onto the garden, gives a wonderfully sunny open feel to the room during the summer months. 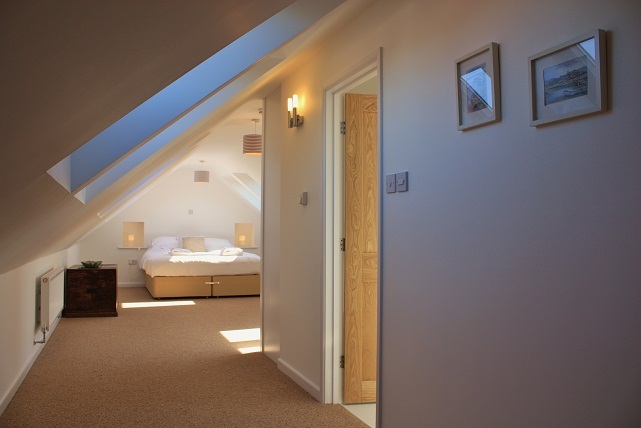 For cosy evenings in there is a 43 inch Smart TV with home cinema system and there is free wifi at the property . 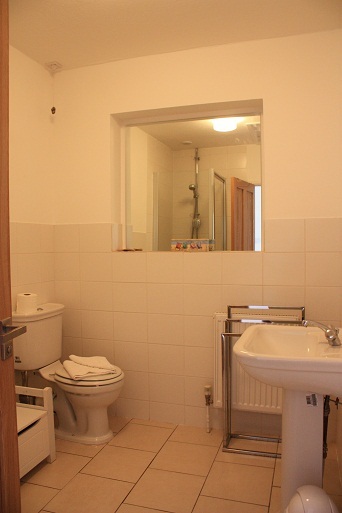 Off the hallway is a useful utility room with a washing machine and a separate downstairs cloakroom with wc. 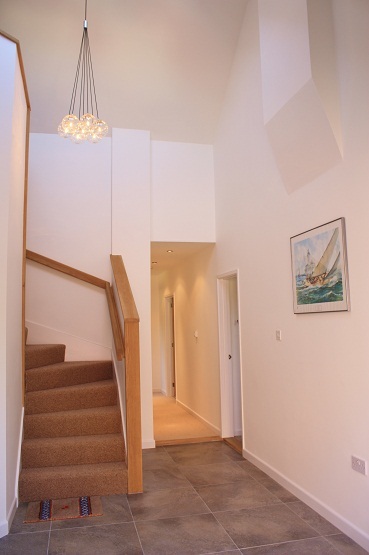 Stairs lead up to the open plan master suite with en suite bathroom which is set in the eaves of the house and is incredibly light with large Velux windows with blackout blinds running down each side of the room. 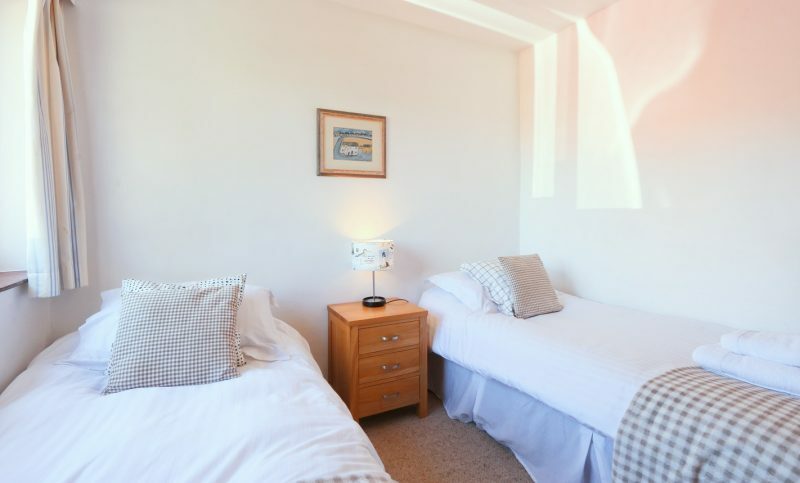 The bed is super king size that can also be 2 singles if required. 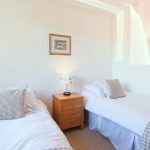 (Do let us know on booking your bed requirement here.) 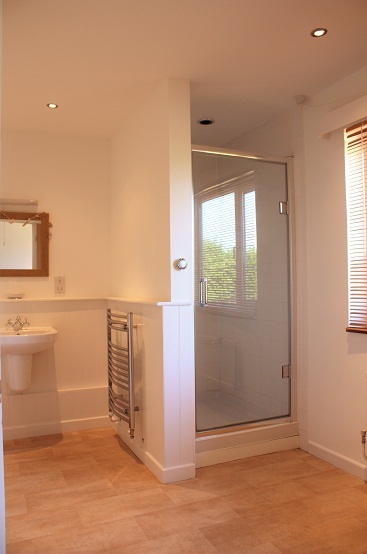 The bathroom has wc and washbasin and bath with hand held shower attachment within the bath. 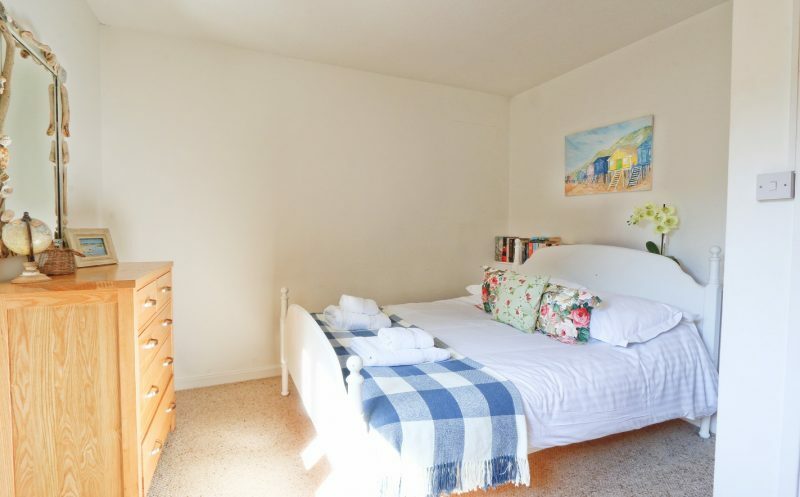 On the ground floor are three further bedrooms, a king size double with large en suite bathroom with both bath and walk in shower, another double bedroom with king size bed and a twin room, sharing the family shower room with wc and washbasin. 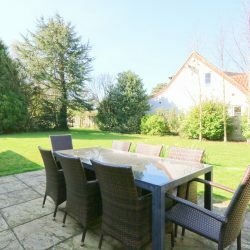 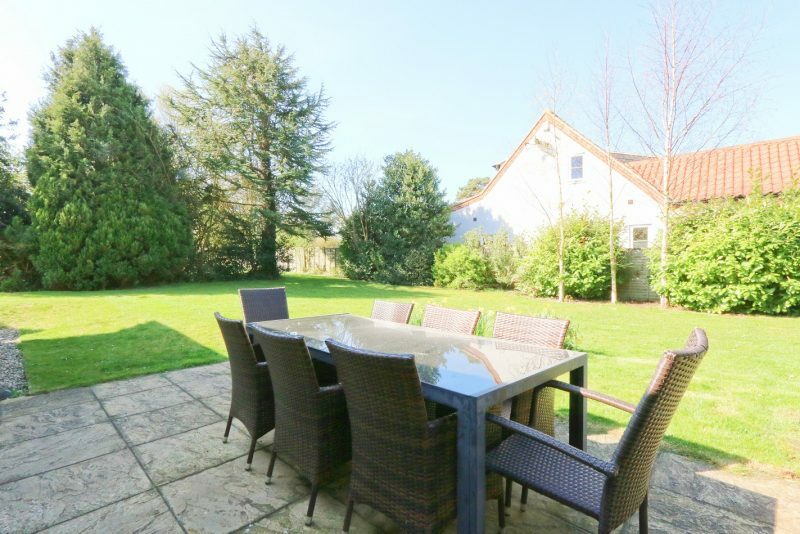 Richmond House is set within good sized gardens, well back from the road with a lawned area and flower beds and ‘u’ shaped double gated drive to the front. 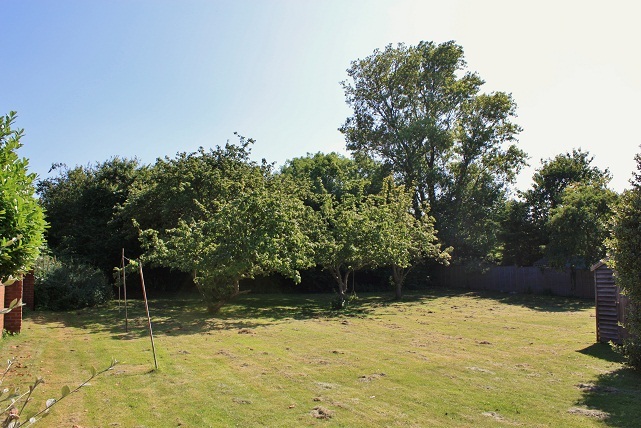 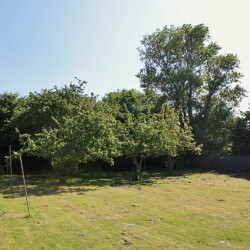 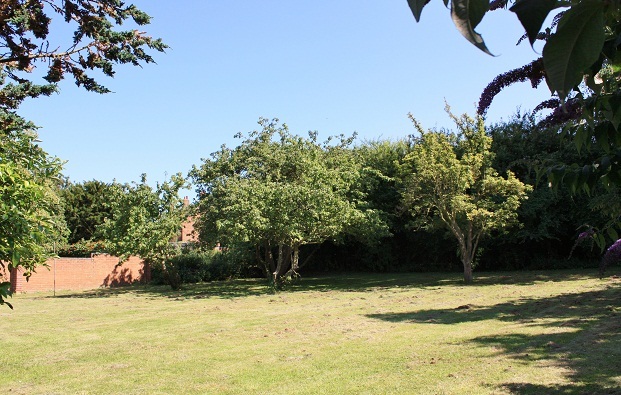 To the rear and side of the house are 2 large lawned areas with mature shrubberies and fruit trees; plenty of room for the children to safely play as the gardens are fully enclosed. 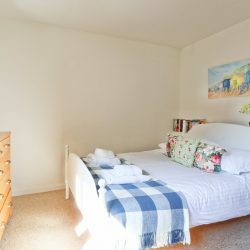 The owners have kindly allowed well behaved dogs to join in the family fun at Richmond House so long as they adhere to the house rules we impose at all our properties – no dogs on furniture or in bedrooms or upstairs at any times and all evidence of their stay cleared up by our guests, both inside and out. 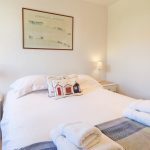 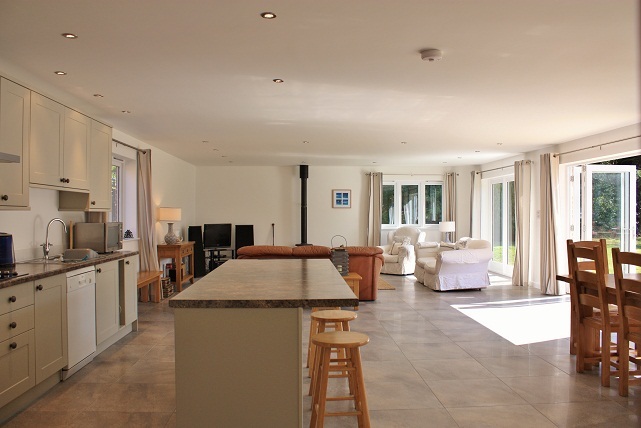 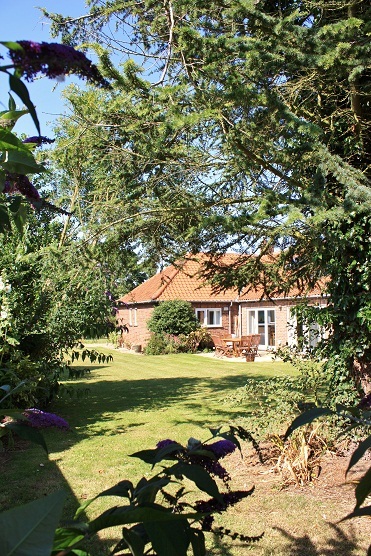 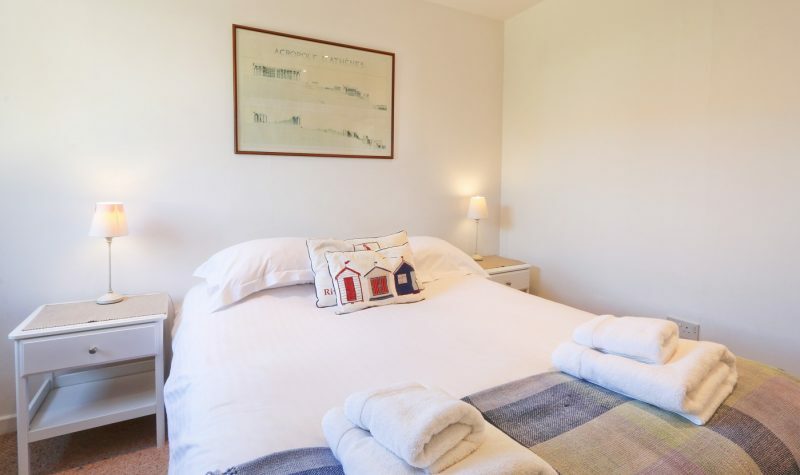 We know our guests are going to really enjoy their stays at Richmond House, the easy going atmosphere the owners have given this lovely coastal property will mean that guests will be very reluctant to hand the keys back in at the end of their holiday!